Our first newsletter of 2019 is posted. Did you remember your dues? 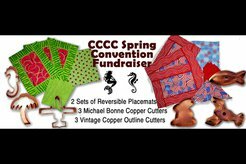 Our Spring Raffle Items are two sets of summer placemats each with 3 copper cutters. Each ticket will go in for both drawings. The purpose of the Cookie Cutter Collectors Club is to share information with others who are also interested in cookie cutters and related items. We research, record and share data with each other regarding the history of cookie cutters. We get together periodically to discuss our favorite topic and show and swap cutters but mostly we enjoy the friends we've made and have lots of fun! There are a number of regional cookie cutter collectors groups all across the country that also have meetings and new groups or new members are always welcome. The club has a facebook page for keeping up with each other and the latest discoveries in cookie cutters. Every two years we have a 3 day convention in a location determined by the presiding president. We put out a quarterly newsletter (available as a digital download or paper copy) and a yearly membership cookie cutter made exclusively for our members. There is also a National Cookie Cutter Historical Museum in Joplin, Missouri, that is open to the public. And each year we sponsor an exclusive Cookie Cutter Week cutter that is available to members for purchase. Member of our Club. . .
A downloadable CCCC Membership Form is available to fill in, print out and mail. You can also purchase a 1 year Subscription or renew your yearly dues by clicking the "Buy Now" button below and using Paypal. . . . . and then enjoy the fun!